This course consists of three modules which were created as part of an online professional development course on the Common Core for STSD's Summer Academy 2014. The course is an online adaptation of PDE's Unpacking the Standards Common Core Training Module. Plans for a larger course are described in detail under the Instructional Design Tab. The reusable learning objects (RLO) were designed using the eLearning software Articulate and were presented to learners via the Learning Management System (LMS) Moodle. They are HTML5 SCORM conformant and were marked by Moodle & placed in the Moodle gradebook. 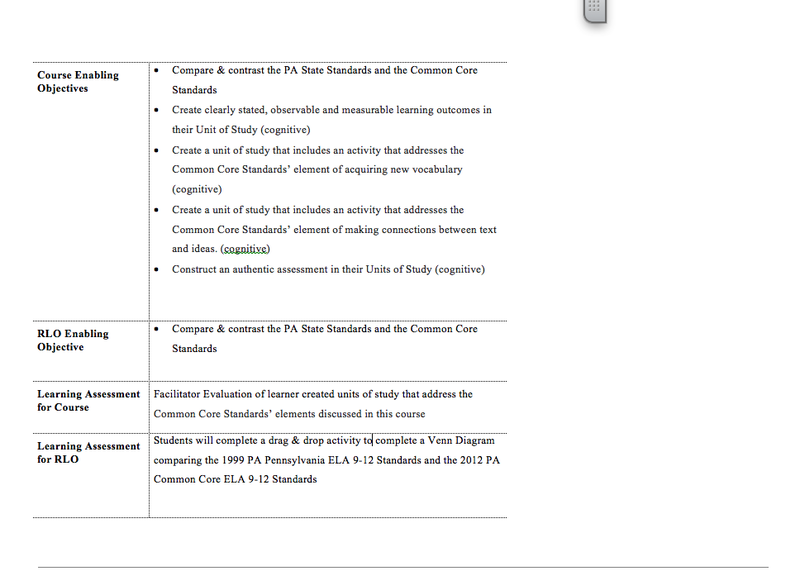 The Design Documents for the STSD Summer Academy Common Core Professional Development: Structure of the ELA Common Core Standards Module served guides for development of course objectives, assessments, instructional strategies, course outline and interface development. You can view selections from the first module's Design Document below. The Storyboard for the STSD Summer Academy Common Core Professional Development: Structure of the ELA Common Core Standards Module 1 is a visual organizer for the purpose of pre-visualizing a web-based training before it goes into production. This storyboard is an adaptation of PDE's face to face training. You can view the storyboard below.